The best thing that could have happened to Jon Lester was having John Farrell as a mentor. The next best thing was Juan Nieves. Lo and behold, Farrell and Nieves joined up prior to the 2013 season as manager and pitching coach, respectively, for the Red Sox. Thus began the process of molding Lester into the ace pitcher all of Red Sox Nation has hoped he'd become. 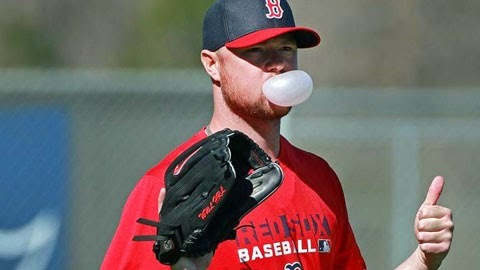 Jon Lester is having a more focused - and relaxed - Spring Training. A year later and Lester is polishing off a World Series trophy while preparing for a new season and a new start. The difference from a season ago - Lester was a dominant force during 2013, whereas he endured his worst pitching season in 2012. Farrell and Nieves now don't have to go and figure out what's wrong with Lester and fix it. Instead, they have the chance to fine tuning a pitcher on the verge of Cy Young candidacy. "You’re not sitting out there worrying about your leg kick, worrying about where your hands are and all that stuff. This is obviously a different point for me than last year and I think it's showed in my work. My bullpen work has been a lot more crisp and I've gotten a lot more out of it. In games, I'm working on commanding the baseball as opposed to other things going for your head. It's been good this year for me." Indeed it has been a good year, Mr. Lester. Despite the fact that he's going into a contract year and looking to resign with the Red Sox, Lester seems to have a clear head. That's when he pitches his best. And that's the affect Farrell and Nieves have had on the young southpaw.